The detection of discrete DNA sequences from a patient’s blood sample in order to diagnose or monitor the progression of disease is the foundation of liquid biopsy and has taken the molecular diagnostic field by storm over the past several years. However, despite all of the promise these tests and advances have shown, the current range of conditions that liquid biopsies can detect is still limited. Results from a new study at the University of Washington, Seattle researchers show that it might be possible, however, to overcome the limitations of liquid biopsies with a method for identifying what types of cells gave rise to the cell-free DNA—potentially expanding the scope of the diagnostic tool. Interestingly, the new approach relies on analyzing the fragmentation patterns seen in the cell-free DNA in one individual and comparing that pattern to what might be expected for cell death associated with various medical or physiological conditions. “Our findings suggest it is possible to identify tissues contributing to cell-free DNA by looking at these fragmentation patterns instead of looking for specific mutations in the DNA,” stated senior study author and Howard Hughes Medical Institute investigator Jay Shendure, M.D., Ph.D., professor of genome sciences at the University of Washington. The extensive amount of DNA that resides within each cell undergoes a versatile set of packaging events to fit inside the nucleus. The DNA is wound and folded around nucleosomes, which are composed of a protein core, like thread around a spool. 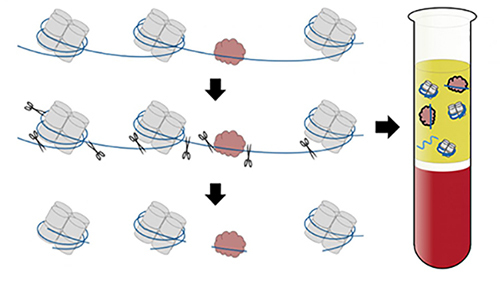 Nucleosomes are strung out along the entire length of the genome, like beads on a string, with the DNA looping around one nucleosome after the next. Each cell type in the body packages DNA slightly differently. These differences leave their tell-tale mark in the resulting cell-free DNA. The UW researchers postulated that they could use these fingerprints to work backward to try to figure out where the cell-free DNA originated. During cell death, the DNA gets chopped into small pieces by enzymes that like to cut the easily accessible, vulnerable sections of DNA between nucleosomes. Previous research has pointed to 13 million positions in the human genome where nucleosomes are most likely to be located. The investigators showed that not only did different kinds of cancer leave different nucleosome fingerprints in the cell-free DNA for some of the cancers, but they were also able to identify the anatomical source of the tumor. Dr. Shendure and his team feel that their new method could be used to diagnose a wide variety of conditions that destroy cells. Moreover, the team believes that a major advantage of the new test is that it may work even when the cells are genetically identical to one another. “Since this strategy does not rely on genetic differences to distinguish between contributing tissues, it may enable the noninvasive monitoring of a much broader set of clinical conditions than currently possible,” the authors concluded.